Jessica and Iain Farrell say they could never have opened a restaurant this early in their careers if it weren’t for The Refined Fool. “In this industry, it’s hard to get off the ground without a lot of resources,” says Iain. But the young couple found efficiencies when they opened their March Hare Snack Bar three weeks ago inside the Refined Fool Brewing Company on Davis Street. Together, with friend and chef Dan Yung, they planned every aspect of the business, created a pub-friendly menu, installed a kitchen in the taproom, and perfected recipes for their own hot sauce, pickles and compound butter. Their culinary philosophy is based on the principle that ingredients must be fresh, local, organic, seasonal and sustainable (FLOSS) whenever possible, said Iain who, trained extensively in the kitchen of a Toronto French bistro. 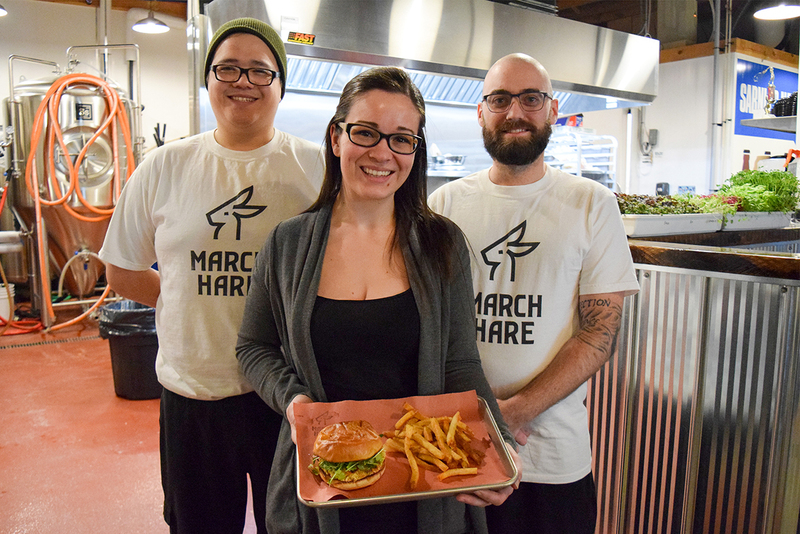 “This is a place where people are drinking so they may order three or four snacks throughout the night,” he said, explaining why March Hare doesn’t have a more conventional menu. The menu is constantly changing and offers daily specials called Staff Meals that range from duck wings to a brisket plate or burgers. The Farrells named the venture March Hare after Lewis Carroll’s iconic Alice in Wonderland character because it suggests unpredictability and a little craziness, said Jessica. Menu items like charcuterie boards include somewhat unusual items like rabbit rillettes and quick pickles for $19 – $25, depending on market prices. “At the same time, our menu has a lot of simple and homey food,” she said. For instance, a helping of baked beans costs $6 and comes topped with maple syrup. It’s early days but March Hare already has regulars who come in once or twice a week. Most popular so far are the onion rings made with Refined Fool Troll Toll beer batter ($7), taquitos ($3.50 or three for $9), and triple cooked French fries ($5 a basket). The benefits of locating a new restaurant within an existing bar include a ready-made clientele. Refined Fool has attracted a large and loyal following since opening in Sarnia nearly five years ago. By leasing space to a separate restaurant operation like March Hare, Refined Fool can assist a start-up and offer its customers a new service, said brewery spokesman Nathan Colquhoun. Whenever possible, Yung and the Farrells deliver their food to the table. The Refined Fool’s Davis Street location just completed extensive renovations and has expanded seating for 72 now. But March Hare doesn’t have full service and requires customers to order at the counter where they can see the open grill and flats of fresh micro greens. Salads are snipped, not tossed. Jessica keeps the books and also works full time for Victoria Playhouse in Petrolia. She met Iain in Toronto when they were both working at a restaurant. He studied music and took up cooking 15 years ago, literally to put food on the table. He met Yung while working in a Montreal restaurant. The three eventually found themselves in Ontario and moved to Jessica’s hometown of Wallaceburg where they operated their own upscale catering business called Fraser House. They connected with Colquhoun when he hired Fraser House to cater a private dinner party. Six months later, Refined Fool offered them the March Hare opportunity. “I just can’t get enough of this,” marvelled Yung. “We’re doing everything ourselves from start to finish. March Hare Snack Bar is located at 137 Davis St. For details, visit www.marchharesnackbar.com or March Hare Snack Bar on Facebook.